1930’S | Book Hub, Inc. Description: Silver Pages on the Lawn is the true story of student lovers and their star-crossed romance that endures parental disapproval as well as the want of time, money, and privacy. To bridge long separations, they make love by words alone. 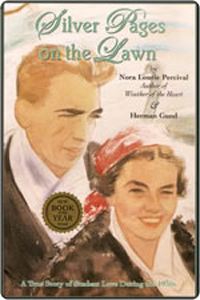 Their passionate, eloquent letters, poignant and poetic, are the heart of this memoir and bring to life the troubled era in which their story takes place—the lean days of the Great Depression, war clouds over Europe, and the literary renaissance of which these aspiring writers were part, form the heart of their history. Silver Pages on the Lawn paints a dramatic picture of the difficult years they lived through and of the steadfast love that survived it all and carried them through to the life they dreamed of. Sales Handle: Silver Pages on the Lawn paints a dramatic picture of the difficult years they lived through and of the steadfast love that survived it all and carried them through to the life they dreamed of.